On June 16, 2014, Williams Companies (NYSE: WMB) announced an agreement to acquire Global Infrastructure Partners’ 50 percent general-partner interest and 27 percent equity interest in Access Midstream Partners LP (NYSE: ACMP) for $5.995 billion. For the mainstream media, this blockbuster deal–the largest in the energy patch this year–served as yet another reminder of the importance of pipelines and other midstream infrastructure to the shale oil and gas revolution. However, for those who follow master limited partnerships (MLP) closely–we maintain a model MLP Portfolio and cover every energy-focused partnership in our MLP Ratings Table–this transaction and the market’s subsequent reaction hold important implications for investors. Although the market recognized Access Midstream Partners’ industry-leading gathering footprint in the Eagle Ford Shale, the Marcellus Shale and the Utica Shale, investors often overlooked Williams Companies’ existing 50 percent general-partner interest and 23 percent equity stake in the MLP. 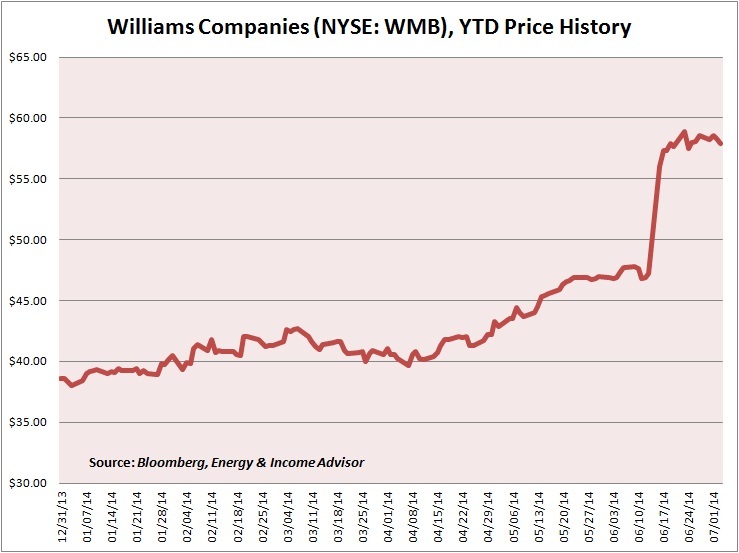 We added Williams Companies to our Model Portfolio in mid-September 2013 in light of the firm’s accelerated progress toward becoming a pure-play general partner and underappreciated exposure to Access Midstream Partners’ rapid distribution growth. This perception started to change in mid-December when hedge funds Corvex Management and Soroban Master Fund disclosed that they had accumulated an 8.8 percent interest in Williams Companies and would push for the firm to unlock shareholder value by pursuing consolidation in the midstream (pipelines and processing) space. First and foremost for many investors, the immediately accretive acquisition will enable Williams Companies to hike its quarterly dividend to $0.56 per share ($2.24 over 12 months), an annualized increase of 32 percent. Management also called for the payout to grow to an annualized rate of $2.46 per share in 2015. Thereafter, Williams Companies projects annual dividend growth of about 15 percent through 2017. In addition to this transaction, the management team announced its plan to accelerate the drop-down of its remaining petrochemical assets to Williams Partners LP (NYSE: WPZ), a blue-chip MLP in which Williams Companies owns the general-partner interest and a 63 percent equity stake. After these deals, Williams Companies would emerge as a pure-play general partner that allocates a greater proportion of its cash flow to paying its dividend. Meanwhile, Williams Partners would pursue and fund about $9 billion in organic growth projects through 2016 and is pursuing a total of at least $25 billion worth of expansion opportunities over the next five years. Williams Companies stands to benefit disproportionately from this distribution growth. Herein resides the appeal of the general partner. The MLP structure often comprises two entities: a limited partnership that owns the underlying assets and a general partner that’s responsible for managing the operating entity. This structure effectively motivates the general partner to pursue initiatives that will enable the operating MLP to grow its cash flow and quarterly disbursements to unitholders; a rising payout at the limited-partner level translates into disproportionate increases to the general partner’s incentive distribution. Although shares of pure-play general tend to offer inferior yields relative to the associated LP units, investors shouldn’t overlook the importance of a growing quarterly payout to a stock’s performance: Not only do rising distributions increase the current return, but they also tend to capture investors’ attention and drive stock prices higher. Read more about the relative advantages and disadvantages of investing in general partners in Profit from General Knowledge. The five largest MLPs by market capitalization–all of which have been public for at least eight years and have amassed huge asset bases–need to generate significant sums of cash flow to grow their distributions. Kinder Morgan Energy Partners LP (NYSE: KMP), for example, must produce almost 28 times as much incremental cash flow as EQT Midstream Partners LP (NYSE: EQM) to support a 10 percent hike to its quarterly payout. For larger MLPs, whole-company acquisitions move the needle on cash flow a lot more quickly and usually grab more attention than organic growth projects. Perhaps in recognition of these hurdles, the general partners to Kinder Morgan Energy Partners, Energy Transfer Partners and Williams Partners–Kinder Morgan Inc. (NYSE: KMI), Energy Transfer Equity LP (NYSE: ETE) and Williams Companies (NYSE: WMB)–have used acquisitions to diversify the limited partners under their umbrellas. This story has played out thus far in 2014, with Williams Companies acquiring the remainder of the general-partner interest in Access Midstream Partners and Energy Transfer Partners acquiring Susser Holdings Corp (NYSE: SUSS), the general partner to fuel distributor Susser Petroleum Partners. And on June 19, the Wall Street Journal reported that Energy Transfer Equity was nearing a $15 billion deal to acquire Targa Resources Corp (NYSE: TRGP), the general partner to Targa Resources Partners LP (NYSE: NGLS). The day after the news broke, Targa Resources issued a statement indicating that it had engaged in preliminary talks with Energy Transfer Equity about a potential business combination and that those discussions ultimately were terminated. The wording of the press release also left the door open for future conversation. 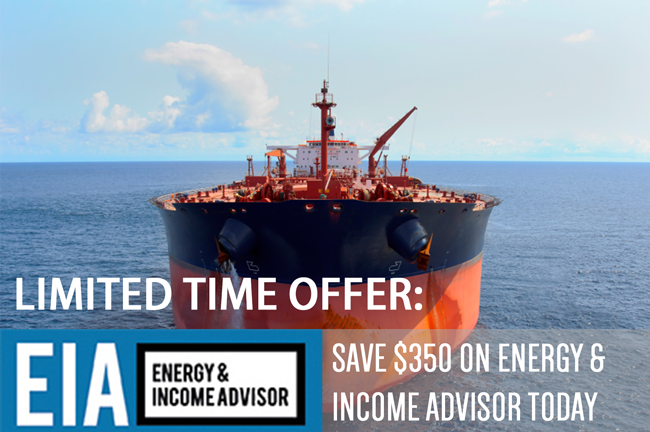 Reports indicated that the deal would have involved merging Targa Resources Partners with Regency Energy Partners; both MLPs have significant capacity to ship, process and fractionate natural gas on the Gulf Coast. The involved parties announced plans to merge Williams Partners into Access Midstream Partners, a combination that would likely increase Williams Companies’ growth prospects. In this merger, holders of Access Midstream Partners would receive an aggregate distribution in 2015 that’s at least 25 percent higher than its targeted payout of $2.79 per unit for next year. This forecast implies a distribution of $3.4875 per unit. Current projections call for the combined MLP to grow this payout by 10 percent to 12 percent in 2016 and 2017. 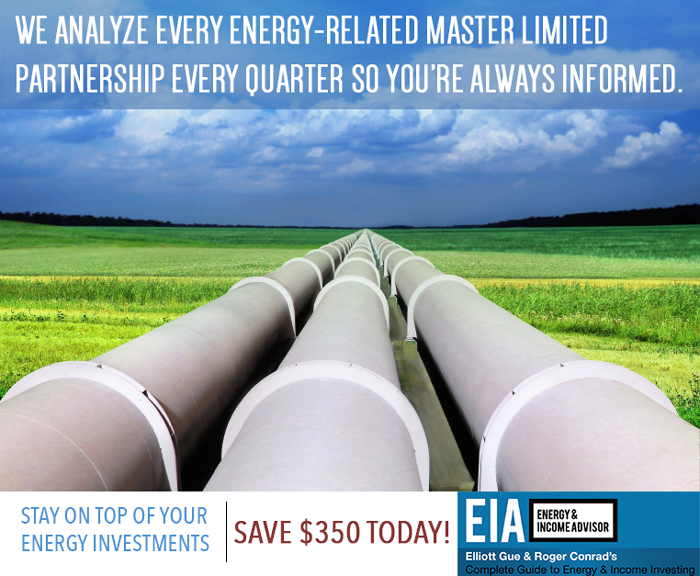 Access Midstream Partners’ current unit price and the combined MLP’s projected aggregate distribution of $3.4875 per unit in 2015 imply a distribution yield of 5.6 percent. The deal calls for investors in Williams Partners to receive 0.85 units of Access Midstream Partners for each unit they hold, plus $0.81 per unit in cash or equivalent units to make up for the slightly lower distribution. Williams Partners pays an annualized distribution of $3.618 per unit. This combination fundamentally changes the value proposition for investors in Access Midstream Partners, an MLP still in the early stages of its growth story–the primary reason that the MLP’s units have underperformed since the deal was announced. The partnership’s gathering lines continue to benefit from accelerated drilling and completion activity in the Marcellus Shale, Eagle Ford Shale and Utica Shale, especially as new takeaway capacity from these basins provides access to new demand outlets. And as former sponsor Chesapeake Energy Corp (NYSE: CHK) divests assets in noncore areas–presumably to operators that would ramp up development–Access Midstream Partners’ system throughput should also grow. These growth drivers enabled Access Midstream Partners to increase its distribution by an average of 33.4 percent annually over the past three years, which, in turn, fueled price appreciation of 121 percent and a total return of 156 percent. 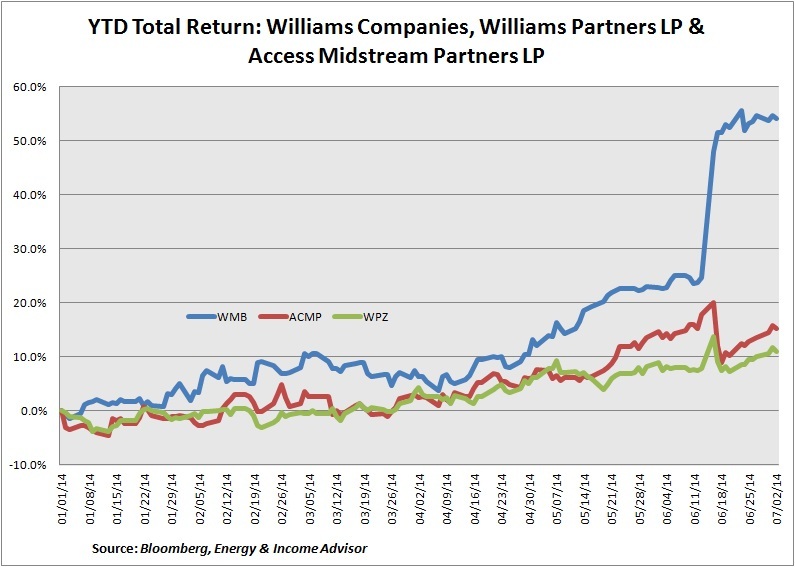 However, Williams Partners must generate about eight times as much cash flow as Access Midstream Partners to support a 10 percent increase in its distribution. Accordingly, whereas Access Midstream Partners’ forecast had called for sustainable distribution growth of at least 15 percent annually over the next several years, the combined partnership is expected to grow its payout by 10 percent to 12 percent in 2016 and 2017. On the other side of the coin, this forecast represents a considerable improvement over Williams Partners’ guidance for 4.5 percent distribution growth in 2016, though that’s of scant consolation to Access Midstream Partners’ unitholders. The tie-up with Williams Partners will also entail more direct exposure to fluctuations in commodity prices than investors in Access Midstream Partners were accustomed. In short, this combination limits the potential for yield compression, a phenomenon that occurs when price appreciation outpaces distribution growth. From 2011 to 2013, price appreciation accounted for an average of 87 percent of the total return posted by the top-performing MLPs from each year. Thus far in 2014, climbing unit prices have contributed about 93 percent of the total return posted by the top 10 publicly traded partnerships. 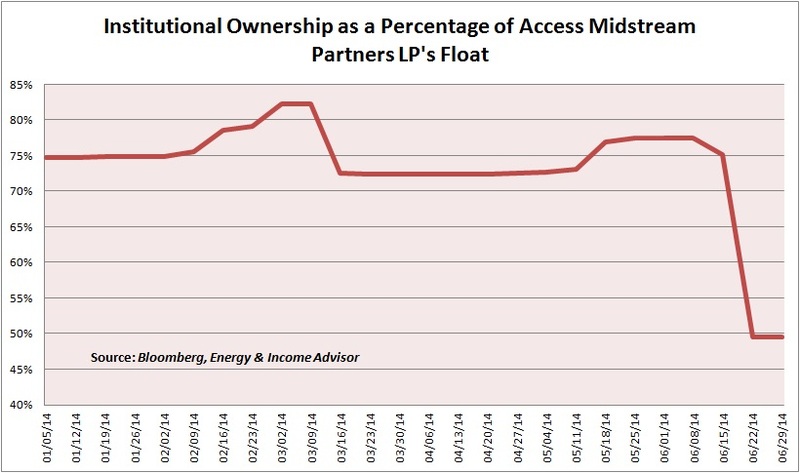 With the potential for these windfall profits severely diminished, institutional investors headed for the exits en masse, reducing their percentage of Access Midstream Partners’ float to 49 percent from a peak of about 82 percent. This exodus makes one wonder if Williams Companies took the unusual approach of having Access Midstream Partners (the smaller partnership) subsume Williams Partners (the larger partnership) to flush out some of this momentum-driven money. More important, this stampede toward the exit demonstrates the extent to which growth-seeking investors have bid up valuations in this income-oriented security class and serves as a reminder that any hiccup or change in an MLP’s growth prospects can lead to a swift downdraft. Larger MLPs sometimes get a bad rap from investors because they require greater incremental cash flow growth to move the needle. On the other side of the coin, these names have the scale and asset bases to pursue growth projects that aren’t feasible for smaller operators. Although the combination of Access Midstream Partners and Williams Partners isn’t expected to create much in the way of immediate cost savings, the integration of these partnerships’ assets will create an integrated platform with significant growth opportunities. For example, the addition of Access Midstream Partners’ best-in-class gathering system in the Northeast addresses a point of weakness in Williams Partners’ existing asset portfolio and enables the combined MLP to capture a greater share of this rapidly growing market. More important, the marriage of these two partnerships creates a mutually beneficial feedback loop. As Williams Partners’ Transco Pipeline and Leidy Southeast, Constitution and Atlantic Sunshine projects provide producers in the Marcellus Shale with much-needed demand outlets, throughput on Access Midstream Partners’ gathering systems will increase. And even if Williams Partners and Boardwalk Pipeline Partners LP (NYSE: BWP) never revive their joint venture to transport the Marcellus Shale’s emerging oversupply of natural gas liquids (NGL) to the Gulf Coast, the addition of Access Midstream Partners’ gathering systems will provide exposure to volumetric growth related to any third-party projects. And looking further down the line, management teams from Williams Partners and Kinder Morgan Energy Partners LP (NYSE: KMP) have indicated that midstream operators already have picked much of the low-hanging fruit (pipeline backhauls, physical and otherwise) for moving natural gas and NGLs out of the Marcellus Shale. By winning more of the incremental midstream dollar through Access Midstream Partners’ best-in-class gathering system, Williams Partners may have slightly more flexibility on project economics than rivals that lack a similar level of integration. And let’s not forget that Access Midstream Partners’ gathering systems in the Eagle Ford Shale and other prominent basins provide a foundation for Williams Partners to expand its operations over the intermediate term.